Pakistan state TV (PTV) has been taken off air after its headquarters were stormed by anti-government protesters in Islamabad. PTV showed live images of crowds breaking open the gates and pouring into its offices before its transmission ended. Latest reports say troops have removed the protesters from the building. Protesters want PM Nawaz Sharif to resign. He denies charges of corruption and electoral fraud. Earlier, fresh clashes erupted between protesters and police. 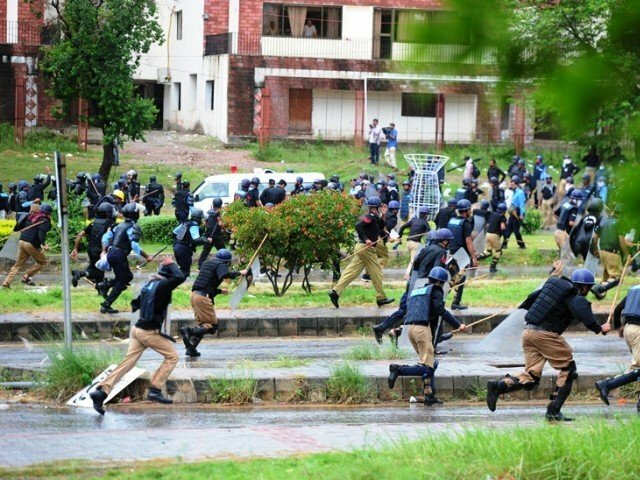 A number of police officers were reported to have been injured in the violence as thousands of demonstrators – some wielding batons and throwing stones – moved on the main building housing Pakistan’s federal bureaucracy and Prime Minister’s House. Protesters attacked vehicles and set fire to shipping containers placed on the road as roadblocks. On Sunday night protesters used trucks to smash through the outer fence of the parliament building. Demonstrators loyal to opposition politician Imran Khan and cleric Tahirul Qadri have been taking part in a sit-in in the centre of the capital for two weeks.